If you live in the City of Chicago, you have no doubt seen the boot installed all over your neighborhood. This is especially true around tax time when the city knows that the residents typically have access to some sort of tax refund from which to pay off city debts. In years past, to be eligible for the boot, a registered owner of the vehicle had to have a fairly significant amount of either tickets and/or debt owed to the city. However, things are much different today. 1) If the vehicle accrues three or more unpaid parking, red light, and/or automated speed enforcement tickets in final determination status. 2) If the vehicle accrues two unpaid parking, red light, and/or automated speed enforcement tickets in final determination status older than one year. Further, once a vehicle reaches boot eligibility status, payment for all tickets is necessary, otherwise the vehicle will remain on the boot list. Additionally, entering into a qualified payment plan for the vehicle will also remove a vehicle from the boot eligible list. 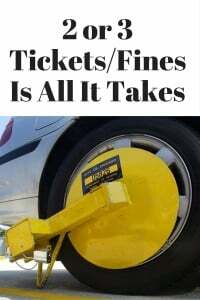 If a resident has tickets listed in the seizure section of a notice, then all fines must be paid within 21 days of the first seizure notice listing such fines and penalties or any vehicle registered in that resident’s name may be booted. This is critical as we have seen secondary vehicles that were co-signed by a resident with tickets become booted. The important concept to consider is that it does not take much in terms of violations to become eligible for the boot. Basically, if you have three or more violations, you are subject to the boot. Additionally, if you have two violations that have matured past the one-year point, you are also subject to the boot. Once booted, there are ways to have it removed. First, you can contact the city within the first 24 hours and pay off the total amount owed or enter into an installment payment plan which is qualified to have the boot removed. If this is not done within the first 24 hours, and the vehicle is towed by the city of Chicago and impounded, the vehicle may be recovered with either full payment, or a qualified repayment plan. Another way to solve your boot situation is to file a Chapter 13 bankruptcy case. Chapter 13 will allow for the repayment of a portion or all of the debt owed to the City Chicago over 3 to 5 year period. During this time, your vehicle will be released back to you and you’ll be free to drive about the city without the fear of another boot. This assumes however, that you do not incur any additional violations which would subject you to being put back on the boot eligible list. The greatest benefit of a chapter 13 bankruptcy aside from recovering your vehicle is the ability to repay less than what is owed over an extended period of time. I have had clients who have owed $5,000, $10,000, $20,000 to the City Chicago for parking tickets which I have turned into $500, $1,000, and $2,000 respectively. You do have rights under federal bankruptcy laws which can assist you if you are struggling financially with the City of Chicago as well as with other creditors. You may contact the office at 847-520-8100 for more information on how chapter 13 can assist you with debt owed to the City of Chicago.